Modern Records boss Joe Bihari got the most out of a new group that his L.A.-based company had signed. On Modern, they were billed as The Cadets. 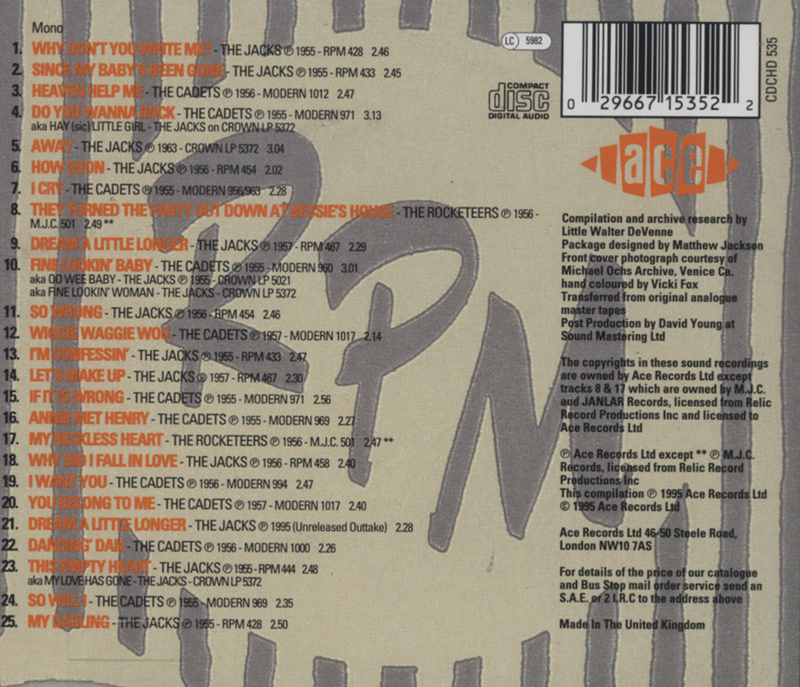 On its sister RPM logo, they were The Jacks. They scored hits under both sobriquets. From the outset, the former L.A. gospel group specialized in covering breaking R&B hits: their '55 debut as The Cadets saw them waxing Nappy Brown's Don't Be Angry. They were loaded with fine lead tenors; in addition to Aaron Collins and future soul star Ted Taylor, Willie Davis fronted The Jacks' first outing, a cover of fellow L.A. outfit The Feathers' Why Don't You Write Me? 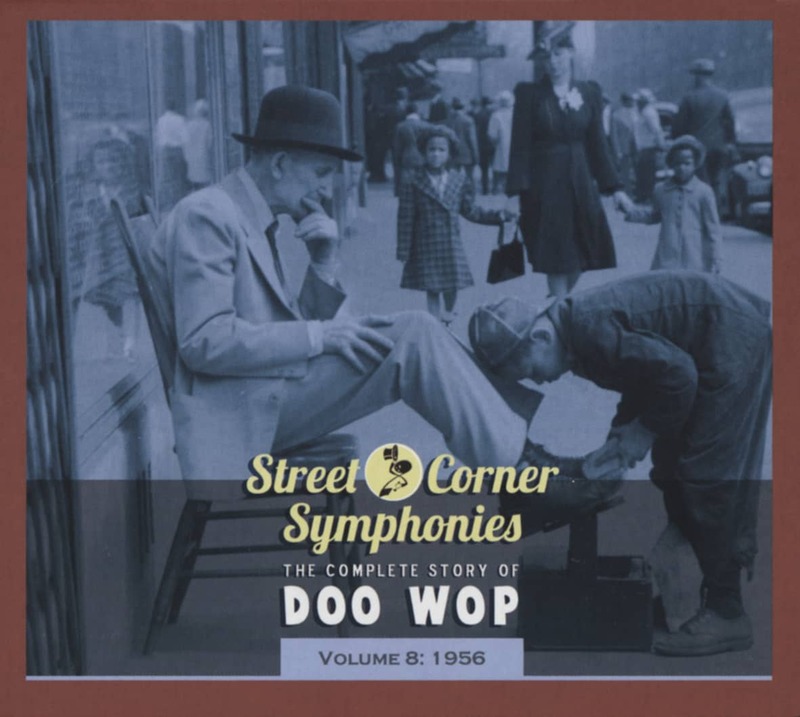 that proved an R&B smash in the summer of '55 (you'll find The Jacks' version on our previous volume). The Biharis issued a torrent of releases under both names, timely covers (The Marigolds' Rollin' Stone, The Willows' Church Bells May Ring, even a personalized treatment of Elvis' Heartbreak Hotel starring bass singer Will 'Dub' Jones) as well as originals. Baritone Lloyd McCraw was replaced near year's end by ex-Flairs tenor Thomas 'Pete' Fox; Taylor went solo in the spring of '56. Then they picked up on the zany Stranded In The Jungle, a recent release by another L.A. group, The Jayhawks, on the Flash label. The Jayhawks' James Johnson co-wrote it. "It's something he sung around New York. It was a little talking thing that they did on the street corners," says former Jayhawk Carlton Fisher. "Then we had another lady named Ernestine Smith. She came up with the music on that 'Baby, Baby' thing. We all worked together and put it together, but in those days, a lot of times you tried to delegate one guy in the group instead of putting everybody's name on it." The Cadets' Stranded In The Jungle was more polished than that of The Jayhawks. Jones intoned the jungle narrative while Collins and Davis harmonized on the swinging doings back home. Prentice Moreland, former Dominoes high tenor, immortalized himself with a "Great googa mooga, let me outta here!" on one break that wasn't part of The Jayhawks' rendition. A head-to-head battle ensued. The Jayhawks' original came out in May and cracked 'Billboard's' R&B hit parade on July 14. The Cadets' cover was issued in late June and entered the charts a week after The Jayhawks. When the smoke cleared, The Cadets barely won, topping out at #4 on two of the magazine's three R&B charts and making an impressive #15 pop showing. The Jayhawks nipped at their heels with a #9 R&B/#18 pop peak. "I wasn't mad, but naturally we were disappointed," admits Fisher. The Collins-led Let's Make Up was The Jacks' last RPM release in mid-'56, but The Cadets endured to the end of 1957 (they had the first issued version of Johnny Watson's Gangster Of Love as the Jones-led Love Bandit). Jones fared best after The Cadets/Jacks broke up, replacing Bobby Nunn as The Coasters' bass. Collins and Davis joined The Flairs, who changed the spelling of their name to The Flares. The Jayhawks morphed into The Vibrations, who scored a string of their own hits. 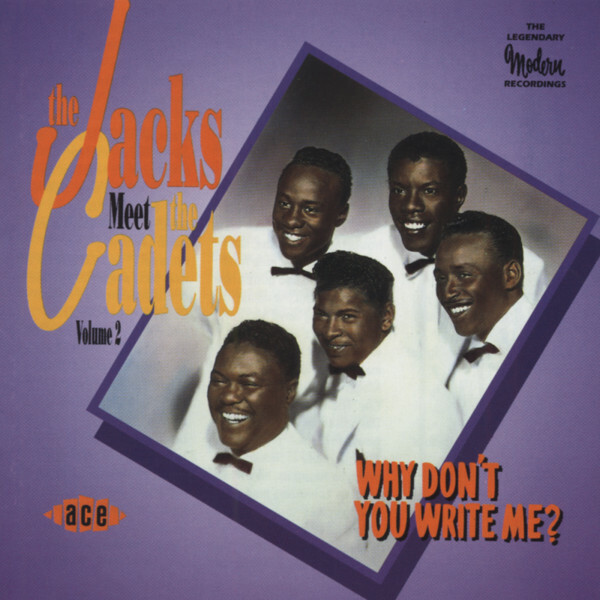 Customer evaluation for "Jacks Meet The Cadets - Why Don't You Write"